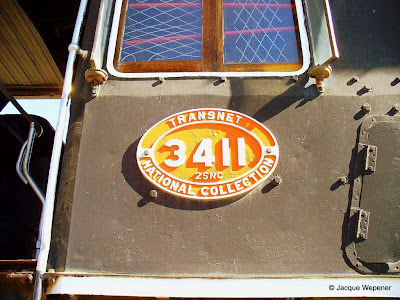 This SAR Class 25NC 4-8-4 Locomotive No.3411 is plinthed at the Kimberley station and is part of the Transnet Kimberley Transport Museum. These pictures were all taken in September 2005. 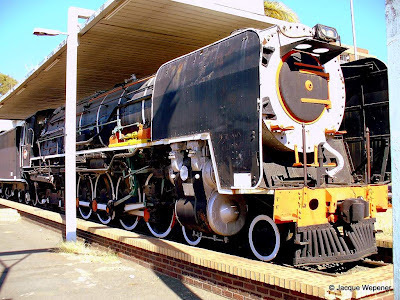 The engine & tender measures 91 feet end to end. 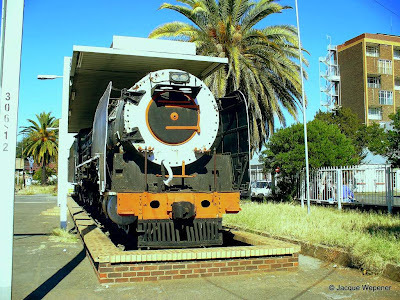 The engine, when working, weighed 117t & the tender 105t. The main cylinder bore is 24" and the stroke 28". 50 engines (no.s 3401-3450) of Class 25NC (non-condensing) were brought into service. 11 were supplied by the North British Locomotive Co and 39 by Henschel. These machines had excellent performance coupled with low maintenance. They started service life on the De Aar - Kimberley section. In 1981 one of the engines, No.3450, was converted into the only member of class 26 - the legendary "Red Devil". The driving wheels are 5 feet in diameter. 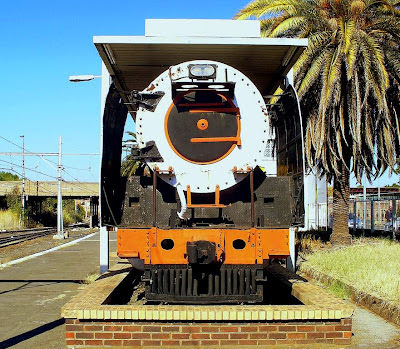 This locomotive was built by North British Locomotive Co as works no 27311 in 1953. 15 June 2012 image courtesy of Jacque Wepener. Jacque commented the No.3411 is in relative good condition, but with need for a proper paint job. The tender has some rust holes. Also check this drawing of the Class 25NC.